And then it hit me…. I had mutts. 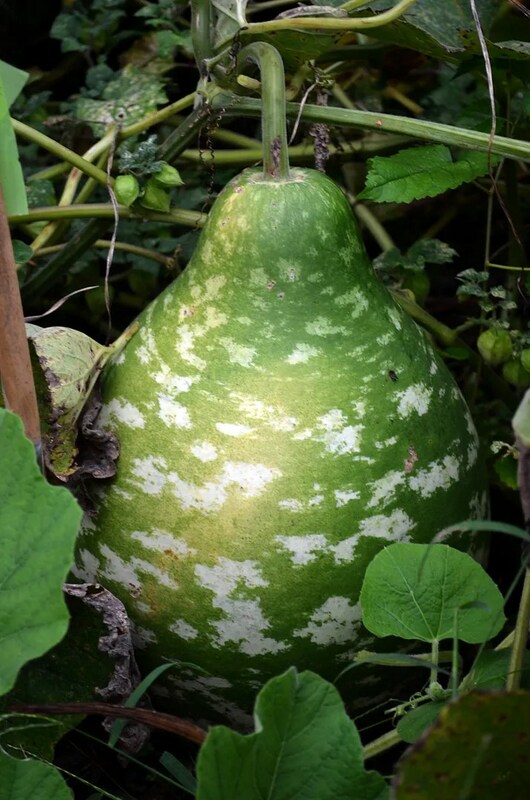 Bushel basket gourds are generally supposed to be a light green in color and roundish in shape, like a slightly flat basketball. “Normal” would be sort of like these two fatties hiding behind boxwoods amongst the ground cherries and ivy. 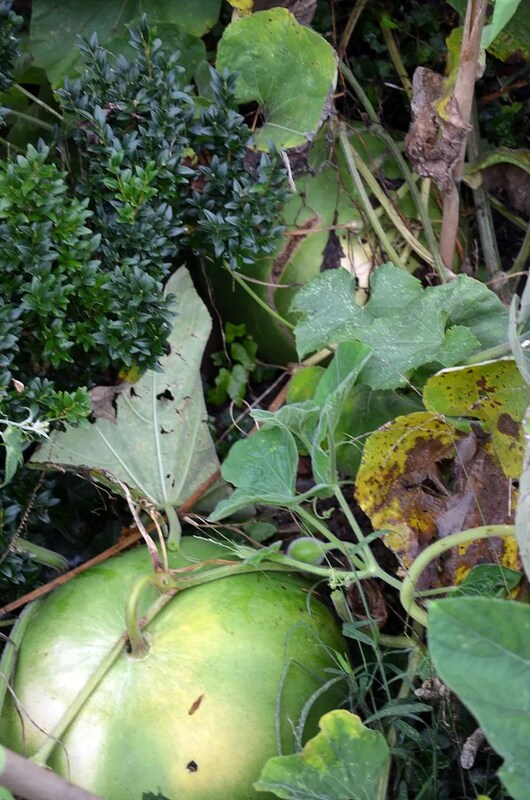 Oh, did I mention I also had a couple of apple gourd vines climbing up and over the back fence as well? 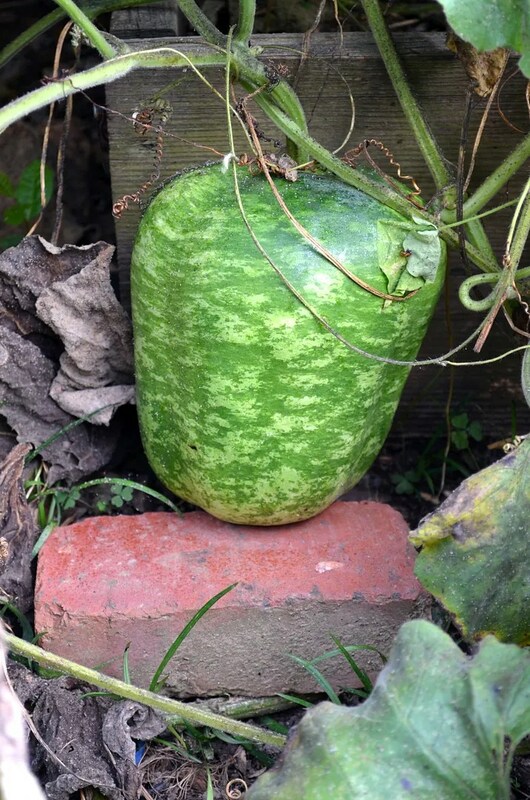 An earlier picture of a typical apple gourd specimen is re-posted below. So (duh), why were half of my bushel basket gourds turning out to be more teardrop shaped with an interesting pattern on them? These were all good sized too; perfectly shaped to be a martin house and probably even a little too big for it. 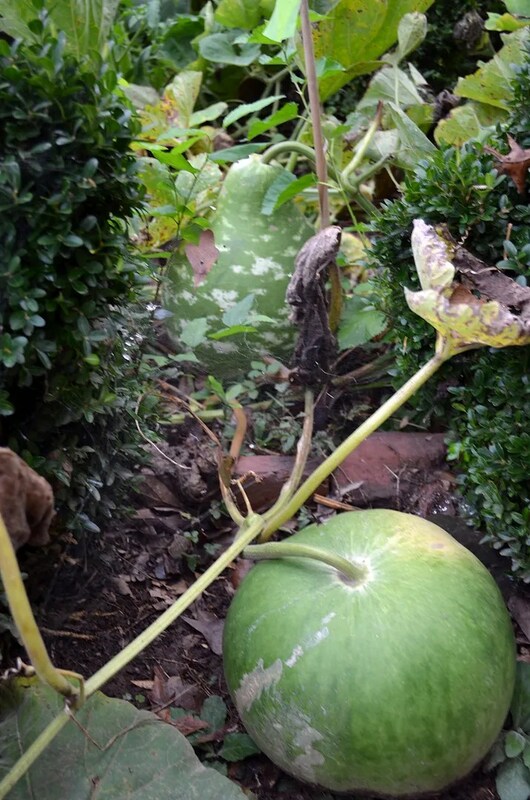 Perhaps gourds cross pollinate pretty easily and end up setting “mutt” fruit? That pattern sure looks a little familiar eh….. 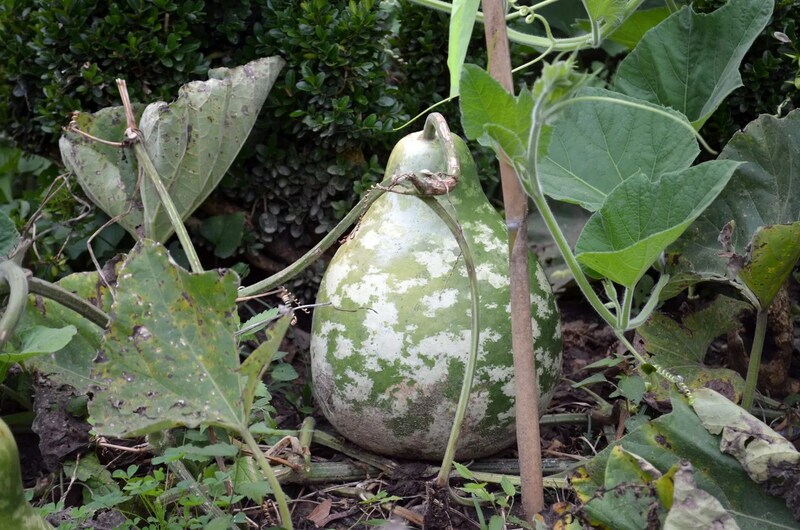 Here are some more mutt gourd pics; do you recognize it now? The stupid part is I knew gourds do this still somehow didn’t recall it from the time I ordered seeds last winter until a few days ago. As I said, “duh”. Oh well… the good news is I will have a bunch to get creative with by the time they are all dry next year. There is a lesson in all things when we stop to think about it. Dang. That is the biggest Splotched Pear I’ve ever seen. I think all pumpkins do this – bees flitter between flowers, not sticking to a specific variety – and so the seeds produced can easily become crosses (ditto for sunflowers). If you want a specific fruit, you need to buy new packets every year, if you’re an equal opportunity gourd producer, save seeds and see what treasures nature provides. I’m pretty sure you’re already the gourd tycoon! Ha. Way too big to eat now…… to be dried and then who knows…..